Council of 11 Members, meets regularly in London. As of January 2017 we have 139 members: 20 Honorary Members, 79 Full Members and 40 Associate Members. Members are UK-wide, and include those based in continental Europe. The Society of Graphic Fine Art exists to promote fine art drawing skills, and to exhibit works of art that demonstrate these skills. 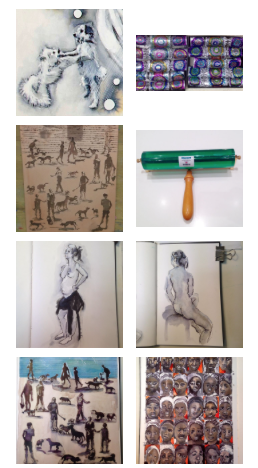 Artwork eligible for our exhibitions includes drawings in any medium (such as pencils, coloured pens and pencils, pen and ink, pastels and oil pastels, charcoal, conté and other media), as well as any original artwork, including paintings, which demonstrate evidence of drawing by hand (for example, original printmaking, watercolours and acrylics). Works of art that are NOT eligible are those which show no evidence of drawing (for example, pure watercolours, pure oil paintings, unglazed acrylics or digital imagery generated by computer), nor do we exhibit giclée prints or any other reproductions or facsimiles. Full Members are entitled to use the letters SGFA after their name, and Associate Members ASGFA. Founded in 1919 to “proclaim the value of good draughtsmanship”. Famous past members included Sir Frank Brangwyn [1st President], Ronald Searle, Dame Laura Knight; past exhibitors include John Piper, Arthur Rackham, Felix Topolski.